I have never met anyone who didn’t love bacon. There are people who don’t eat it as part of their diet, but bacon flavor seems to be universally loved…at least in my universe. Americans owe our love of bacon, in part, to Edward Louis Bernays. Never heard of him? He was Sigmund Freud’s nephew, and a genius in public relations and propaganda. Bernays was a master of psychology and other social sciences and is considered the first modern marketing and PR wizard. In his day, in the 1920s, he handled many advertising campaigns. One of them was for bacon. He convinced America, using Freud’s ideas of subconscious manipulation and indirection that the all-American breakfast consisted of eggs and bacon. In order to get people to consume more bacon, he produced a doctors’ survey that recommended that patients eat bigger, heartier breakfasts. The results of the report were sent to 5,000 doctors and included publicity that a hearty breakfast should include eggs and bacon. The message took hold. We don’t need much persuasion today. Bacon is still on the breakfast menu, and increasingly on the desert menu too:Chocolate covered bacon bars (Vosages), candied bacon ice cream (David Leboviz), Brioche-Bacon Bread Pudding (NYC Dovetail), and Bacon-flavored Popcorn (Nosheteria). The Perfect Bacon Sear – try the Five (5) Easy Steps to Grilling It! 1. Identify the hot and cool spots on the grill. You’ll want to flash the bacon on a hot spot to start the process, render and cook on a cool spot and return to the hot spot for the finale. 2. Sacrifice a strip of bacon and grease up the grate. This won’t prevent all the strips from sticking, but it will help and add a more intense flavor. 3. Lay the strips of bacon at a 45 degree angle to the grates. This will help prevent them from falling into the grill. A safety note: be ready for flare-ups and handle them with a spray bottle. 4. 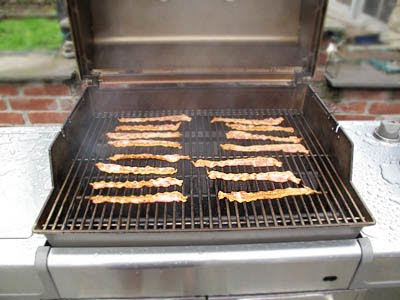 Cook the bacon strips over the hot spot until they start to shrivel up, and then flip with your tongs and move to a cool spot to crisp up. Cooking time will vary greatly, so just hang out and keep an eye on them. Build the suspense by enjoying the wonderful scent of cured pig and fire. 5. For the finish, darken the bacon over the hot spot one more time. It should be dark rust colored, the fat should be rendered, and it should be crispy but pliable. This method will produce consistent and solid results. To spice things up, try adding brown sugar or maple syrup to the bacon at different stages in the cooking process. Amazing! Being someone who loves food, language and their history, I’m curious about the word “turkey.” For me it’s a head-scratcher. There are only a couple of species of large birds that are relatives to our Thanksgiving favorite: the wild turkey of North America and another that’s native to the Yucatán Peninsula. What does that have to do with the country of Turkey? The Aztecs domesticated their large birds, and the Spanish conquistadors misidentified them as guinea fowl. During the sixteenth century, guinea fowl were imported to Europe from Madagascar through…wait for it…Turkey. The bird traders became known as turkey merchants, and their product shortened to “turkey” in English by 1555. It makes some sense, but how about common phrases like, “talking turkey,” a “turkey shoot,” a “turkey” in bowling, or, “That movie’s a ‘turkey’”? Any idea about those? A “turkey shoot” in the middle of the 20th century was a marksmanship competition where turkeys were tied to a log; and their heads stuck up as targets, you know the rest. A “turkey” as a failure comes from Hollywood in the 1920s. And in bowling, 100 years ago, during Thanksgiving and Christmas weeks, bowling alleys would give a live turkey to the first bowler who could get three strikes in a row. But “talking turkey”? Not a clue. Speaking of “talking turkey”, check out this really cool recipe. Combine chicken broth, hot sauce, Worcestershire sauce, garlic powder, salt and cayenne pepper in a medium bowl; mix well. Preheat oil in a deep fryer to 400°. Remove giblets and neck from the turkey. Pat turkey dry with paper towels. Inject 1/2 cup mixture into each side of turkey breast. Inject 1/4 cup mixture into each leg/thigh area. Place turkey, breast side up, in basket. Slowly lower basket into hot oil, being cautious of splattering oil. Maintain oil temperature at about 350°. Fry turkey for 3-1/2 minutes per pound. Remove from oil to check for doneness. Insert an instant-read thermometer into thickest part of thigh, not touching bone. Temperature should be 180°. Remove turkey from hot oil and drain on paper towels. Coat the outside of the turkey with Buffalo-style sauce. Let rest for 15 minutes before carving. First of the season Passion Fruit grown from California. Panta packed and available only for a couple of weeks. The passion fruit is a round or ovoid fruit, 1-1/2 to 3 inches wide, has a tough rind that is smooth and has a dark purple skin. It contains membranous sacs containing orange-colored seeds that are pulpy and juice. VERY LIMITED SUPPLIES CALL AHEAD. 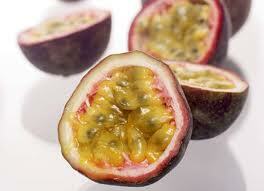 The distinctive tart-sweet flavor of passion fruit makes a refreshing dessert or intermezzo. Serve it over diced mango and papaya for a tropical fruit salad. Look for passion fruits that feel heavy for their size (they'll yield more juice). There are two common varieties: the purple subtropical type grown in California, Florida, and New Zealand; and the yellow tropical fruit grown in Hawaii. Either variety will work in this recipe, although the purple fruit has sweeter juice and a stronger flavor and perfume. It's essential to let passion fruits ripen at room temperature until their hard skin is dented and wrinkled, as this sweetens the pulp. Make a simple syrup by combining the sugar and water in a small pan and bringing to a boil over high heat. Stir to dissolve the sugar, then remove from the heat. Add the passion fruit pulp and salt to the sugar syrup and cool to room temperature. Refrigerate, covered, until completely cold. At this stage the mixture can be stored up to 2 days. Strain the syrup through a fine mesh sieve set over a bowl. Press hard to extract all the liquid; discard the seeds and pulp. Stir in the lime juice and rum. Transfer to an ice cream maker and process according to the manufacturer's instructions. Freeze until firm. In a small bowl, combine the lemon juice, oregano, oil and garlic. Set aside 1/4 cup for basting; cover and refrigerate. Pour the remaining marinade into a large re-sealable plastic bag; add the lamb. Seal bag and turn to coat; refrigerate for 8 hours or overnight, turning occasionally. Prepare grill to medium high heat, brush grates with oil or coat with non-stick spray. Drain and discard marinade. 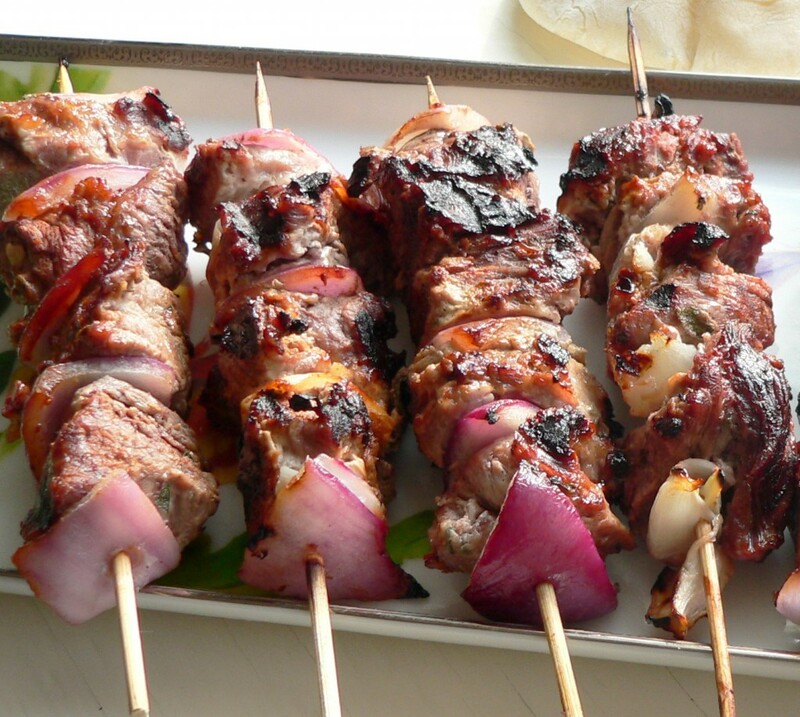 On eight metal or soaked wooden skewers, alternately thread lamb, tomatoes, green pepper and onion. Grill kabobs, uncovered, over medium heat for 3 minutes on each side. Baste with reserved marinade. 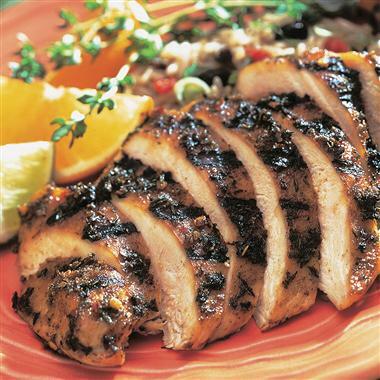 Grill 8-10 minutes longer or until meat reaches desired doneness, turning and basting frequently. 1. Sift together flour, cornmeal, sugar, baking powder, and mustard into a bowl. Whisk together egg, milk, and 2 tsp. oil in another bowl. Add milk mixture to flour mixture, beating with a wooden spoon until batter is smooth. 2. Pour oil into a large, heavy pot to a depth of 3''. Heat oil over medium heat to 350°. Meanwhile, dry hot dogs with paper towels, then skewer them with wooden skewers. Dip hot dogs into batter until evenly coated. Gently place battered hot dogs in hot oil and fry, turning once or twice, until crisp and golden, about 3 minutes. Drain on paper towels. Serve with mustard and ketchup if you like. Why Update the Kid's Menu? There are a number of reasons why a strong kid's menu is a great business decision for a restaurant. Kids influence more than 55% of dining out decisions. Parties with kids account for 1/3 of all dining out occasions. For parties with kids, the major motivating factor in restaurant choice was friendly service scoring 86 out of 100. Specifically, parents appreciate when servers address their kids directly. More importantly parties with Kids Have Significantly Higher Check Averages. Overall parties with kids checks are 83% higher than adult only parties. If you haven't looked over your kid's menu in a while, it might be time. Yes the dish formerly known as goulash is making a big comeback, if it ever went away. Authentic gulyás is a beef dish cooked with onions, Hungarian paprika powder, tomatoes and some green pepper. Potato and noodles (csipetke in Hungarian) are also added according to some recipes. Hungarian goulash is neither a soup nor a stew, it’s somewhere in between. Though in Hungary it’s considered rather to be a soup than a stew, so look for it among Soups on restaurant menus. 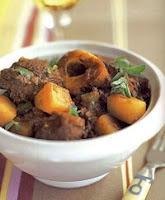 If cooked in the proper way goulash has a nice and evenly thick consistency, almost like a sauce. In Hungary gulyás is eaten as a main dish; noodle or pastry dishes, especially the ones made with cottage cheese (túrós csúsza, túrógombóc, strudel) go down well after the heavy soup. Heat oil in a large skillet over medium high heat, add meat, onion, and garlic; cook and stir until meat is browned. Stir in ketchup, Worcestershire sauce, brown sugar, salt, paprika, mustard and 1 1/2 cup water. Reduce heat, cover, and simmer 2 to 2 1/2 hours. Blend flour and 1/4 cup water. Stir into meat. Heat to boiling, stirring constantly. Serve hot. The situation in Mexico is not looking good for the upcoming season. The warmer temperature that Mexico has had in the last several few weeks has not stabilized the contamination of white spot disease in the shrimp ponds. The situation in the farms in Mexico has gotten worse. The farms in Hermosillo (northern Sonora), where we purchase most of our Mexican shrimp, have been contaminated with white spot disease; however some of the farms are being hit worse than others. Farmers, who are noticing even a little higher mortality than normal, are harvesting the ponds immediately. Most of the farmers are not restocking the ponds that they are harvesting now because they are afraid that the new stock could be contaminated and lost. There is a “fire” raging in Mexico right now and the damage cannot be assessed until the “flames” are put out. We are still a few weeks away (mid August) from assessing the final damage. At this point in time, what ever shrimp will survive, will survive now and what ever shrimp will die, will die now. The health of a pond could change one day to the next. For the farmers that will make it to the final harvest in September-October, they anticipate pulling mainly sizes 26/30-36/40. Our suppliers expect that we will see no farm-raised 16/20 and very limited supply of 21/25 this year. They believe that most farmers will be nervous about extending their final harvests any longer than September-October. The temperatures were unseasonably cold immediately after stocking this year. This set off the white spot outbreak, but also was responsible for very slow growth. The Mexican domestic market prices will remain unusually high as buyers compete for the limited product that is available. Last week, one farmer sold 26/30’s in the domestic market at US$ 6.00/lb.! Depending on how long it takes for the demand in the Mexican domestic market to be filled, forecasts indicate that the volume of exportable shrimp from Mexico could be down as much as 75% this year, when compared to last year. The projection for sizes of ocean shrimp this season indicates that we will see less of the larger sizes that normally come from Mexico, particularly from the bays. Right now, it seems that we may see 21/25 - 31/35 from the bays this season, as opposed to U/15 - 21/25. This is due to colder water temperature at the start of the growing season. We served this last February for the Brimanda Events Crabfest at Massimo in Walnut Creek. In a skillet melt the butter over medium high heat. Saute the leeks until soft. Add the sausage and cook for about 5 minutes breaking it up. Add the mushrooms and cook for a couple more minutes. In a bowl toss together the bread crumbs, sausage, and veggie mixture. In another bowl mix the remaining ingredient, then combine the two bowls. Pour into a grease baking sheet and press down firmly. Aloow the pudding to set for 30 minutes before baking. Bake for 1 hour until nicely browned. 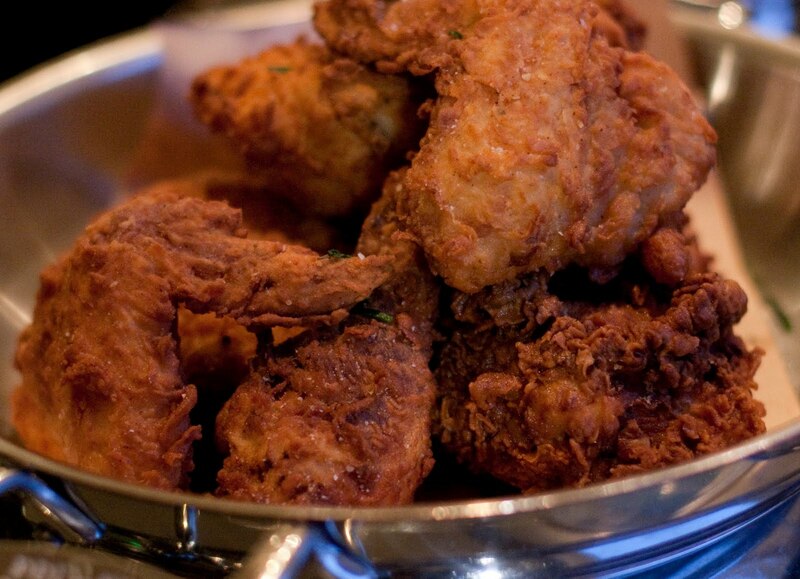 The Best Fried Chicken Ever! Combine all the ingredients in a large to, cover, and bring to a boil. Boil for one minute, stirring to dissolve the salt. Remove from the heat and cool completely, then chill before using. The brine can be refrigerated for up to 3 days. 1. 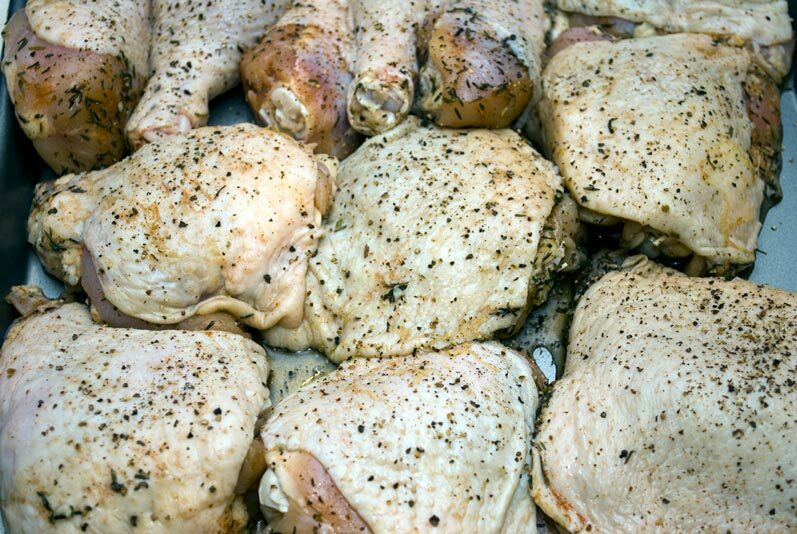 Cut each chicken into 10 pieces (2 legs, 2 thighs, 4 breast quarters and 2 wings). Place in a container with brine and cover. Refrigerate for up to 10 hours. 2. Remove chicken from brine and rinse under cold water. Pat it dry with paper towels. 3. Combine all the ingredients of the Coating in one bowl. Divide the mixture into 2 bowls and put the buttermilk into a third bowl. 4. Preheat fryer to 340 degrees. 5. Beginning with thighs, dredge the chicken in the first bowl of coating, then dip it in the buttermilk, and finish by dredging in the second bowl of coating. Repeat with all pieces of chicken and place in the deep fryer. 6. Fry until browned and crisp and remove from the oil and allow to drain. 7. Transfer to a serving platter and enjoy! Tilapia is a mild white fish that really does well with the big adobo marinade flavor. Get a griddle or cast iron pan hot and lightly coat with veg oil. Place chilies on the griddle and toast until slightly darker but not charred. When you have the chilies toasted on both sides remove from the heat and place the garlic on. Turn the garlic often till browned and remove from the heat peel and reserve. Break the chilies into small pieces and place them into a small bowl, cover them with boiling water and weigh them down with a plate to submerge, let soak for 30 minutes. Drain tear into smaller pieces and place in blender with garlic. Soak the corn husk in boiling water covered for about 10 minutes. Let stand in water off heat for a couple of hours till pliable. When you are ready to make this ddish separate out the husks that are at least 6-7 inches long and at least 6-7 inches across at the widest part of the husk. Pat the chosen leaves with a towel. Cut the fish into ½ inch thick strips and mix gently but thouroughly with 6 tablespoons of adobo paste. Cover and refridgerate for at least 2 hours. Lay out the husks and spread 1 teaspoon of the adobo over a 2x3 inch area on the widest part of the husk. 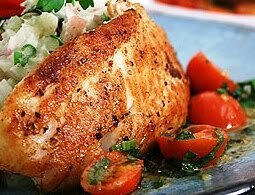 Lay half of a portion of the fish on the adobo rubbed husk and sprinkle with salt, to with the other half portion of fish and sprinkle with salt again then spread with another teaspoon of adobo paste. Bring the uncovered sides of the husk up and around the fish, tucking one under the other. Fold the unfilled narrow end of the husk up over the filled part. Then flip the package over on to the wide end of another husk open end toward the center. Bring the sides of the husk up and around the package, tucking one under the other. Fold the narrow end of the husk up over the wide part, repeat this wrapping process one more time for a triple wrap. Lay the finished package flap side down and tie it twice around its width with 2 thin strips made from the husk. Blindfolded, you can taste the differences between a Honeycrisp apple and a Fuji. You love Brandywine tomatoes and Cherokee Purples. At the cheese counter, you order Royal Blue Stilton or Shropshire Blue depending on your mood. Congratulations, you’re a foodie. Now, what about pork? What do you know about your bacon? As it turns out, the story of American pork is pretty interesting. We have the Spanish conquistadors to thank for the introduction of pigs to the new world. In the sixteenth century, Spanish explorers brought pigs to South Eastern America. Eventually, these animals either escaped or were let out and became foragers. It was long thought that the breeds originated in Spain, but recent DNA testing (yes, someone is out there testing "porkies" genealogy) revealed that our pigs were most likely not from Europe at all; they came from the Canary Islands (off the coast of Northern Africa), which was a frequent stop of the explorers on their way to the New World. Later, other breeds arrived from Europe and elsewhere. By the 1930s, there were fifteen different breeds of pigs in the U.S. Sadly, six breeds are now extinct. Several other breeds have 200 or fewer animals remaining, although they are making a comeback because of small farmers who raise them for specialty retailers. Pork is popular everywhere in the U.S., of course, but in the South it has a special place of importance. Much of that tradition comes from the history of pigs in America. The earliest pigs five hundred years ago foraged and lived throughout the South, from Florida to Texas. No wonder that when we think of BBQ (where pork reins supreme), we immediately think: delicious southern. Cook pork in 10-inch skillet over medium heat about 10 minutes, stirring occasionally, until no longer pink; drain. Stir in papaya and pineapple. Heat, stirring occasionally, until hot. Heat oven to 425F.Spoon about 1/4 cup of the pork mixture onto half of each tortilla; top with about 2 tbsp. of the cheese. Fold tortillas over filling. Arrange five of the filled tortillas in ungreased jelly roll pan, 15 1/2x10 1/2x1 brush with melted margarine. Bake uncovered about 10 minutes or until light golden brown. Repeat with remaining tacos. Serve with Papaya Salsa. minutes. Reserve half of sauce for basting and half for dipping. covered, for about 2 hours or until fork-tender. remaining basting sauce, for 15 minutes or until slightly crispy on the outside. The market has started slipping this week. Availability still varies amongst all the suppliers and this is what has made possible the gap in pricing. Most suppliers will agree that overall production has improved moderately over previous weeks. Warm weather and foggy mornings has caused for irregular growth patterns, expect mildew and burn to be seen regularly. Suppliers are cleaning up product as best they can, but it is still best to expect some defects upon arrival. Other quality issues include pink ribbing, discoloration, and mechanical damage. The romaine market continues to be steady with good supplies and competitive pricing. Green leaf is softer as growers have ramped up production in Salinas. Mildew and tip burn are still seen upon arrival sporadically. This is due to warm temperatures, mixed in with past rains. We are still seeing red discoloration in all leaf items due to the previous rains that we had here in Salinas. This market is being called stable for now but could change towards the tail end of this week. Some suppliers are experiencing gaps in production on both bunched product as well as crowns. Good weather continues to exist in all of the growing regions. Mexico supplies will be moderate throughout the week. The quality is expected to be strong throughout the week in all of the growing areas. The cauliflower market is steady to start the week. Early forecasts indicate this commodity will be tighter in availability later in the week. Pricing will be stronger. Some suppliers continue to have better availability and this has caused variations among the different growers in respect to pricing. Planting gaps are likely in the near future with this commodity. Santa Maria and Salinas are the two big growing regions at this time. California carrots are coming out of Bakersfield with good supplies. Yield and quality are good and there should not be any gaps for the next couple of months. Look for Michigan to kick off very soon. This market is getting stronger on all sizes, although 24’s continue to have the best availability. Oxnard is starting to fall to the way side and will be finished by the end of June, leaving only Salinas to fill all demand. Overall, the quality has been nice with good weights. Expect the market to rise. Good demand this week is being met with lighter supplies. This is mostly due to cool weather slowing down harvest numbers, and good demand for the 4th of July. Quality is good with a few fair lots. Supplies are still be harvested out of Santa Maria, Salinas and Watsonville. Some of the growers in Santa Maria have switch their fields to the freezer market due to the weak market conditions. Quality is best out of the Salinas and Watsonville growing areas at this time. Supplies are peaking this week out of Salinas and Watsonville areas. Quality is good and the increased supplies are pushing the market down. Supplies are mostly from Mexico this week as California is just getting started. Most of the Mexican supplies will stop crossing as this week moves on due to low fobs and quality starting to go down. California supplies are slowly building with good quality. The market has been weak, but may it firm up over the next week. Supplies are good out of both the east and west coasts the start of this week. Quality is good with a steady market. New Jersey growers have started with limited volume this week. The main pack size on both coasts is pints with a few 6oz being packed. reds and yukons and has good quality but limited supplies as they will only ship for two more weeks. Alabama and North Carolina will begin packing at the end of June. California and New Mexico continue packing all sizes, and colors of onions. The availability is generally lower in California especially on mediums and pre-packs, because cooler than desired temperatures have delayed their maturity. There are plenty of onions in the field they just aren’t quite ready for packing so expect changes soon. Once dry, warmer weather settles in for any stretch of time, they should come along quickly. New Mexico has better availability on jumbo and larger yellows. The red market is steady in New Mexico and lower in California due to supplies. Whites are lower in both areas due to light demand. The quality has been good in both areas and the size has been large on yellows and reds, while the whites are smaller and producing more mediums. Two tiered market exist right now between California fruit and Mexican fruit with California fruit going at a premium price. The overall quality is excellent out of both areas with good size and excellent eating quality. The color on the flames is excellent as a result of cooler than normal nights which helps bring on the color and allows the fruit to finish itself. The sugarones are starting to pick up in volume in Mexico and California and we are starting to see some very nice finished fruit that is eating better each day. We expect plenty of fruit and we should have a smooth transition from Mexico and the California desert , into the Central California Valley which will take us through December on fruit. Washington fruit is still mostly large and heavy to the higher grades in the reds, golds, and granny-smith varieties. The smaller counts and lower grades are still in short supply in all varieties and will remain so for the rest of the storage season. The markets on all three varieties are mostly steady but deals remain on 48, 56, and 64 size fruit. Gala’s and Fuji’s are the only two varietals left and the Galas are very limited. Cameos, Jonagolds, Honeycrisp, Braeburns, Pink Lady’s, and Romes are all finished. D’Anjou pear supplies are lighter again and the market is higher and strong as we near the end of the season. Most shippers only have large size US#1 grade fruit left and expect to have supplies for the next two weeks. The quality has been good. Expect domestic pear prices to continue to climb until the end of the season. New-crop green and Red Bartlett pears will be available in late July from California. MEXICO- Growers continues at a much slower pace as their season is nearing the end of this year’s crop. CALIFORNIA – Growers continue to harvest good supplies, and demand is very good. Most of the California fruit is still small, but with the warming weather, the size is coming. Market steady to strong as demand has been very good, overall quality is fair as they are experiencing some re-greening and having to gas the fruit about 24 hours to bring back the color. The fruit is eating excellent and has good juice content, but you will see some softer fruit due to the gassing. The 88’s and smaller are the toughest sizes due to us peaking on 72’s and 88’s and not getting an overwhelming amount of 113’s and 138’s. We are packing out 70-80% fancy and the balance choice which is keeping the choice shorter in supply. We will have plenty of fruit through the summer and will hopefully have fruit until we start navels around the first of November, weather will be the deciding factor. Market is steady to strong with fairly tight supplies out of dist. 2, we are peaking on 115’s and 140’s which is keeping the smaller fruit tight, the overall quality is good to fair depending on the ranch. The juice content is excellent and you will see some fruit with a light green tinge. Expect the market to stay steady and possibly try and inch it’s way for the next few weeks until we start to see some Chilean arrivals which should help keep prices a more stable and possibly ease off. We expect dist.2 fruit along with Chilean until we start the dist. 3 fruit around the first of September. Better supplies this week on smaller fruit, but larger fruit is shorter in supply. Market is fairly steady with good volume coming out of Arizona and lighter volume out of the California region, Mexico is also crossing minimal numbers. The overall quality has been good with mostly a green to light straw cast and some fairly smooth netting. Sizes are peaking on 9’s and 12’s fruit. Expect the desert regions to start to lighten up on volumes in the next week or two and then we will see the market begin to strengthen due to a later than normal start out of the Westside deal around the second week of July. Market is steady with supplies out of Mexico, California and Arizona. We are seeing lighter volume out of California and increasing volume out of Mexico and Arizona, we should see similar transitions to the Westside as we are seeing in the Cantaloupe. The overall quality has been very good with excellent sugar and firm fruit. The overall scarring has been heavier than we would like to see, but overall quality is good. We are peaking on 4’s and 5’s keeping the market on smaller fruit stronger. Supplies are falling off on both seeded and seedless watermelon out of Mexico. Quality remains good. Domestic fruit will become more available the end of this week with better volume next week. Better supplies on seedless product with seeded watermelon in light supply. Prices are still at the bottom. The mini seedless are in better supply and quality is good. Georgia still has a few cucumbers but the quality out of those regions is questionable. Farther to the north, there is better quality but they do not have volume yet. The market will be two tiered for the next couple of weeks as small windows of product pop up and die down just as quickly. Michigan/Ohio will be into volume in another 2-3 weeks which should even everything out. Mainland Mexico production is dropping in volume as they are ending their season. There will be limited production through the month. Baja production has slowed as some cooler weather is holding production back. Demand is very good. Except for a handful of clean up picks this week the California desert is finished. Bakersfield harvest is limited in volume as growers are cleaning crown pick and peaking on extra large and jumbo size. Volume will still be 10 days out. The California desert crop for colored bells is going with good supplies of red, but some growers are starting to finish, so tighter supplies are coming. Yellow bells are tight as supplies begin to drop. Since Georgia is just about the only real volume region in the southeast and the West is in short supply we could be looking at a continued upward trend in the pepper market. Small areas in Tennessee and the Carolinas will pop up with pepper in the next week or two but until Michigan and Ohio are ready in August, pepper will continue to be a struggle and quality will fluctuate. Mainland Mexico has finished for the season. Baja has slowed due to cooler weather. Fresno has good production, but will move into their mid summer gap in 2 weeks and Santa Maria is going on Italian and will pick up volume over the next 2 weeks, and yellow is starting this week with light production. Michigan and Ohio are working squash this week. All other states to the south are still into squash but the market is all over the place, depending on where it is loading. Quality is better the farther North you go and by the beginning of next week, Georgia will no longer be an option and the market should even out. Ruskin area of Florida has finished harvest for the season. Tomatoes continue to be harvested in Quincy, Florida as well as South Carolina and Arkansas. All of these growing areas are ahead of harvest schedules due to the heat incurred during the growth of the plant. The supply of tomatoes has significantly decreased compared to the levels that have been harvested over the last month. Overall size has decreased also as the end of the growing season in these areas approaches. These factors are pushing the market upward and look to remain higher for the next few weeks while we await the start of the next growing areas. California and Tennessee are expected to begin harvest around the 4th of July and Virginia around the 2nd week of July. Roma and vine ripe tomatoes continue to be imported from Mexico. The crop that is crossing through Nogales is now finished, leaving product still crossing from Baja and through McAllen. These two areas will continue to have fruit through November. The quality remains good on these crops and markets are still trading at low levels. As some of the demand now shifts from the southeast to these areas, the markets will firm up on the Mexican product also. Rules of Thumb for Beverage Costs: How's Your Restaurant Doing? Although every restaurant is unique, industry rules of thumb can provide a valuable starting point for evaluating and understanding how your restaurant is performing. While there will always be exceptions, here are a few beverage cost rules of thumb that we've found to be quite reliable over the years when working with operators who have collectively managed thousands of diverse restaurant operations. * Liquor - 18 percent to 20 percent. that are used or consumed exclusively at the bar). beer will generally be higher). price per bottle, the higher the cost percentage). NOTE - All percentages above are the ratio of each item's cost divided by its sales, not total sales or total beverage sales. For example, liquor cost percentages above are based on liquor costs divided by liquor sales. This applies to the non-alcoholic beverage costs discussed below as well. Non-alcoholic beverage costs: Historically it has been standard industry practice to record non-alcoholic beverage sales and costs in Food Sales and Food Cost accounts. However, we've found that many operators are now breaking out non-alcoholic beverage sales and costs and report on them separately as "Soft Beverages." little more than a penny an ounce for the syrup and CO2). some cream, sugar and about one free refill). FINAL POINT: While every restaurant is different, if your costs are running significantly higher than the averages above, it might be smart to investigate your pricing, beverage controls and the possibility of theft. vinegar, mustard, salt and pepper in a small bowl. 3. Just before serving, cut pears into 16 slices each. remaining dressing; toss well. Divide among 8 plates. Campbell Soup Co. is recalling 15 million pounds of SpaghettiOs with meatballs after a cooker malfunctioned at one of the company's plants in Texas and left the meat undercooked. The Agriculture Department announced the recall late Thursday. Campbell spokesman Anthony Sanzio said the company is recalling certain lots of the product manufactured since December 2008 "out of an abundance of caution" because officials don't know exactly when the cooker at the Paris, Texas, plant malfunctioned. Officials believe it happened recently but aren't sure, he said. The meatballs that went through the cooker did not get the requisite amount of heat, according to the company. The USDA said there are no reports of illnesses associated with the product and Sanzio said the company has received no customer complaints to date. Sanzio said the company believes there are about 35,000 cases of SpaghettiOs subject to the recall on the market right now. He said USDA announced the recall of 15 million pounds because that is all of the product that has been manufactured since December 2008. Much of it has likely been consumed. Consumers with questions about the recall can call Campbell's Hotline at (866) 495-3774. Jimmy Dean, a country music legend for his smash hit about a workingman hero, "Big Bad John," and an entrepreneur known for his sausage brand, died on Sunday. He was 81. "He was amazing," she said. "He had a lot of talents." Born in 1928, Dean was raised in poverty in Plainview, Texas, and dropped out of high school after the ninth grade. He went on to a successful entertainment career in the 1950s and '60s that included the nationally televised "The Jimmy Dean Show." In 2009 a fire gutted their home, but his Grammy for "Big Bad John," a puppet made by Muppets creator Jim Henson, a clock that had belonged to Prince Charles and Princess Diana and other valuables were saved. Lost were a collection of celebrity-autographed books, posters of Dean with Elvis Presley and other prized possessions. With his drawled wisecracks and quick wit, Dean charmed many fans. But in both entertainment and business circles, he was also known for his tough hide. He fired bandmate Roy Clark, who went onto "Hee Haw" fame, for showing up late for gigs. The Chicago-based company let him go as spokesman in 2003, inciting Dean's wrath. He issued a statement titled "Somebody doesn't like Sara Lee," claiming he was dumped because he got old. "The company told me that they were trying to attract the younger housewife, and they didn't think I was the one to do that," Dean told The Associated Press in January 2004. "I think it's the dumbest thing. But you know, what do I know?" By the early 1950s, Dean's band had its first national hit in "Bummin' Around." "Big Bad John," which is about a coal miner who saves fellow workers when a mine roof collapses, became a big hit in 1961 and won a Grammy. The star wrote it in less than two hours. His fame led him to a string of television shows, including "The Jimmy Dean Show" on CBS. Dean's last big TV stint was ABC's version of "The Jimmy Dean Show" from 1963 to 1966. Dean became a headliner at venues like Carnegie Hall and the Hollywood Bowl and became the first country star to play on the Las Vegas strip. He was the first guest host on "The Tonight Show," and also was an actor with parts in television and the movies, including the role of James Bond's ally Willard Whyte in the 1971 film "Diamonds Are Forever." He was working at the Desert Inn hotel when he was cast as Willard Whyte in Diamonds Are Forever (1971). Whyte was clearly modeled after Howard Hughes, who owned the Desert Inn and was therefore, by extension, Dean's employer at the time. In the late '60s, Dean entered the hog business — something he knew well. His family had butchered hogs, with the young Dean whacking them over the head with the blunt end of an ax. The Dean brothers — Jimmy and Don — ground the meat and their mother seasoned it. His fortune was estimated at $75 million in the early '90s. "I've seen so many people in this business that made a fortune," he told the AP. "They get old and broke and can't make any money. ... I tell you something, ... no one's going to play a benefit for Jimmy Dean." "It's the sweetest piece of property in the world, we think," he told the Richmond Times-Dispatch. "It sure is peaceful here." INTRODUCING: RECIPE 999, RECIPES TO FEATURE AT $9.99 OR LESS! 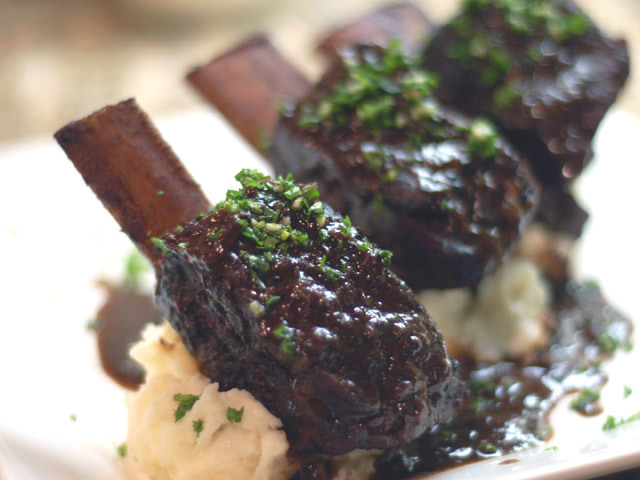 Short ribs are a popular cut of beef. Beef short ribs are larger and usually more tender and meatier than their pork counterpart, pork spare ribs. Short ribs are cut from the rib and plate primals and a small corner of the square-cut chuck. A full slab of short ribs is typically about 10 inches square, ranges from 3-5 inches thick, and contains three or four ribs, intercostal muscles and tendon, and a layer of boneless meat and fat which is thick on one end of the slab and thins down to almost nothing on the other. There are numerous ways to butcher short ribs. The ribs can be separated and cut into short lengths, typically about 2 inches long, called an "English cut", "flanken cut" across the bones, typically about 1/2 inch thick, or cut into boneless ribs. Short ribs may be long-cooked, as in pot-au-feu, a classic of French cuisine, or rapidly seared or grilled, as in Korean cuisine, in which short ribs called galbi, are marinated and grilled over charcoal. 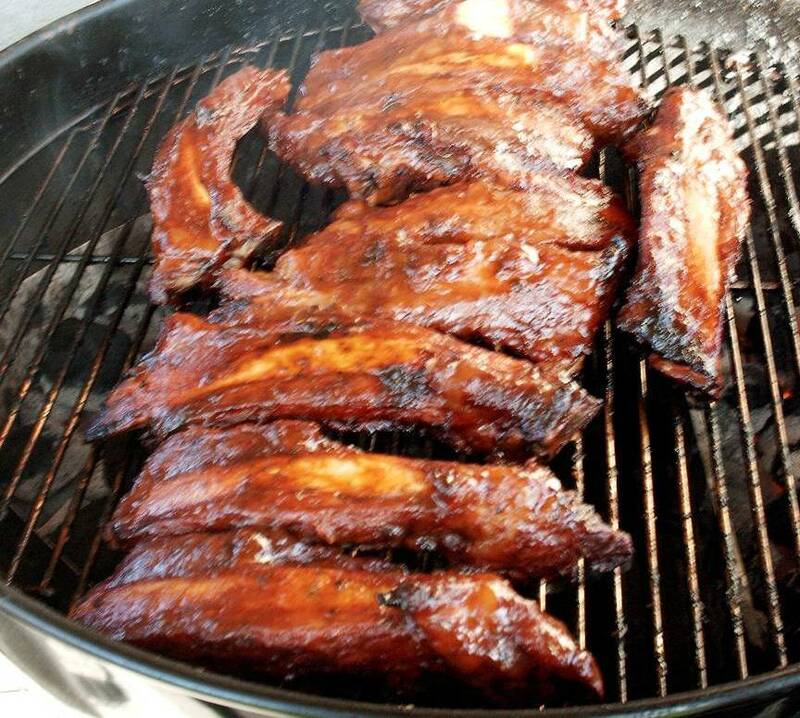 A specific type from Hawaii is known as Maui-style ribs. Other popular preparations are barbecue and braising. In this recipe for Asian Style Short Ribs the short ribs are slowly braised for 3 hours with classical style asian flavors, finished for the last 10 minutes in a reduced sauce and served over jasmine rice. deep enough so that the short ribs are submerged in the liquid. keep warm. Increase the oven temperature to 425 degrees F.
over medium-high heat. Reduce the liquid until only about 1 1/4 cups remain. 2 tablespoons of orange juice and the lemon juice. It's here! Begining next Thursday night at the Aquarium is 34th Annual Monterey Wine Festival. Prepare to thoroughly enjoy a night at the Monterey Bay Aquarium unlike any other! When the doors of the Grand Tasting open at The Monterey Bay Aquarium guests will receive a commemorative wine glass and be welcomed to a world class venue unlike any other for discovering new wines and sipping cellar favorites too! Enjoy the ability to choose from over 400 wines and sample the fantastic fare of local restaurants and national gourmet food manufacturers - all the while you visit the incredible marine displays of The Monterey Bay Aquarium. It really is a magical experience at The Monterey Bay Aquarium. Enjoy the Oyster Bar with a great pinot gris! You'll savor and delight in the flavors of California and beyond. Master sommeliers will be available to answer questions. Whether you are in the industry, a wine enthusiast or on your way to becoming one this event is not to be missed! You'll find that next great wine buy and discover new eating establishments that will temp your taste buds and end up on your dining calendar. All samples of food and wine included in the ticket price. June 11th 5 - 8 pm New Releases and More at the Monterey Conference Center! 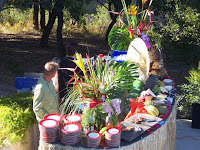 Prepare to continue your celebration of fantastic wines and gourmet food offerings at the Monterey Conference Center. A night of new releases and past best of the barrels will highlight wineries accomplishments for the guests palate! These new releases are always a cause for celebration and what better place to sip, savor and swirl than the beautiful Monterey Conference Center? This combination of world-class wine, a silent wine auction, and of course exquisite gourmet offerings, make this a not to be missed happening. You'll have the opportunity to taste hundreds of different wines,meet,talk and learn from some of the world's most knowledgeable wine experts in an enjoyable environment. Live music will act as a backdrop and a place to relax with fellow wine enthusiasts on the tasting room floor. Wine enthusiasts and food lovers will savor and remember the flavors they experienced at the Monterey Wine Festival long after the doors to the Conference Center are closed. All samples of food and wine included in ticket price. New this year.....The "B's" of wine.."Best of Class." Test your knowledge: While at the festival you'll be able to test your wine tasting skills with the experts! One of our expert wine judges and sommeliers will have a variety of wines that they've "judged." See how close you come to their choices for Best of Class and more. June 12th Noon - 3 p.m at the Monterey Conference Center. New this year.... The C's of wine, or should we say Sea's? Nothing tastes as great as exceptional seafood and a fantastic pinot gris or beautiful white wine. At this first ever happening you'll be able to taste the seas - chowder to be judged for the Best of the Best Chowder Competition. Our panel of judges will choose their pick and you'll be able to try them too while you sip on some fantastic wines and other gourmet offerings! Sorry limited to 300 people. Drawn by a combination of world-class wine, educational seminars presented by industry leaders, cooking demonstrations by distinguished chefs, a live wine auction, and exquisite dining, the festival has expanded to include more than 125 California wineries and more than 3,000 wine lovers. Sample from over 400 wines and enjoy a gastronomic delight with fine cuisine from local restaurants. You will have the opportunity to taste more than 1,000 different wines, and meet, talk with, and learn from some of the worlds most knowledgeable wine experts. Whether wine is your livelihood, your avocation, your hobby, or just something you'd like to learn more about, the Monterey Wine Festival is for you. If you are on Facebook become a fan of their Facebook page to keep up on news and events. The queen of France, Catherine de'Medici, adored spinach so much she insisted it be served with every meal. Even today, dishes made with spinach are referred to as "Florentine" as Catherine was from Florence, Italy. Originating in ancient Persia, spinach was an item used in trade, eventually making its way to China and across Europe. But it was a sailor who put spinach on the American radar—Popeye the Sailor, to be precise. Remember those disproportionate forearms, anchor tattoos, and his corn cob pipe? He gulped spinach into popularity. The spinach-growing community of Crystal City, Texas went so far as to erect a statue to recognize Popeye’s positive influence on the spinach industry. Thanks to Popeye, spinach has a reputation of being the anabolic steroid of vegetables. That’s a bit unrealistic, but spinach does contain great nutritional value. Especially when eaten fresh, steamed, or quickly boiled, spinach is full of antioxidants, iron, and Vitamins A, C, E, and K.
Looking for a way to add some panache to a meal? Just add spinach. This leafy green has been capturing the appetites of many for centuries. Nutritional and delicious, spinach is an ingredient found in dishes for every meal. Omelets at breakfast, salad at lunch, and in pasta at dinner. Of course it's never a bad idea to enjoy a spinach snack like Popeye. Preheat oven to 500 degrees F with the rack in the lowest position. Sprinkle cornmeal on a large baking sheet. Cook onion with 1/4 tsp salt in 2 Tbsp of oil in a large heavy skillet over medium heat, stirring occasionally, until beginning to brown, 8 to 10 minutes. Add garlic and cook until fragrant, about 1 minute. Add spinach and cook, stirring frequently, until wilted, about 2 minutes. Stir in red peppers, olives, and pepper to taste. Remove from heat. Roll out dough on a lightly floured surface with a lightly floured rolling pin into a 14-inch round, then cut into quarters. Roll out 1 quarter into an 8-inch square (keep remaining pieces covered) and arrange with corner nearest you. Put one-fourth of filling on lower half, leaving a 1-inch border, and top with 4 pieces of cheese. Fold dough over to enclose filling. Seal edges. Beginning in 1 corner, stretch sealed edge outward, pinching and rolling dough up over edge to resemble a rope, working your way around. Transfer to baking sheet. Make 3 more calzones in same manner. Cut 3 steam vents in top of each and brush with remaining olive oil. Bake until golden-brown, 13-15 minutes. Cool 5 minutes before serving. This sounds really good Shawn, I think I'm making this Sunday night for the family! To prepare curry, heat a large skillet over medium-high heat. Coat the pan with cooking spray. Place half of the beef in skillet; cook 1 minute on each side or until browned. Remove the beef from pan. Keep warm. Repeat process with the remaining beef. Lower heat to medium; add oil to pan. Add shallots, ginger, garlic, and chiles; cook 4 minutes or until tender, stirring occasionally. Stir in coriander and next 6 ingredients (through cinnamon); cook 30 seconds, stirring constantly. Return beef to pan. Add broth; bring to a simmer. Cover, reduce heat, and simmer 35 minutes or until beef is tender. Uncover and cook 10 minutes or until sauce thickens. Discard cinnamon stick; stir in juice. To prepare rice, bring 1 1/4 cups water and remaining ingredients to a boil. Cover, reduce heat, and simmer 18 minutes or until liquid is absorbed. Remove from heat. Let stand, covered, 5 minutes. Fluff with a fork. Place 2/3 cup rice onto each of 6 plates; top each serving with 1/2 cup curry. I'm sitting at Tanimura and Antle's T&A Cafe having a breakfast burrito listening to a couple truck drivers who were both Marines swap service stories. Great stories about advanced water training for the one guy that had previously never had any water experience. This guy is a natural entertainer, sitting here with his guitar strumming Cheeseburger in Paradise for the breakfast crowd while he decribes saving a drowning soldier. Don and Cheryl Ferch are husband and wife as well as co-owners of Contemporary Catering . They have been creating extraordinary events for their clients since 1988 and are proud of their family owned business that is based in the kitchen at T&A Cafe. Their motto is "Let Contemporary Catering Turn Your Dreams Into Reality!" His career has offered him many opportunities. Starting with a move to Santa Barbara as executive chef of the historic El Paseo Restaurant. 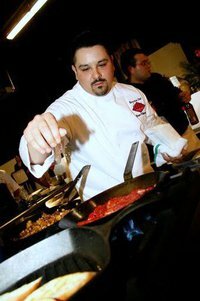 Relocating to Monterey County as Executive Chef at, the Highlands Inn. 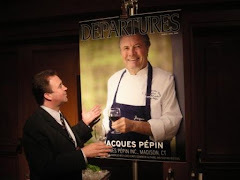 Where he received acclaim from Travel holiday, Gourmet magazine, San Jose Mercury News, Los Angeles Times and was honored as Chef of one of the top 100 Restaurants in Northern California. 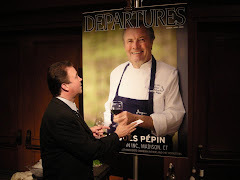 Don was the founding Chef and organizer of the MASTERS OF FOOD & WINE held annually at the Highlands Inn.While building his business, in 1988, he was voted Chef of the Year by the Monterey Bay American Culinary Federation. 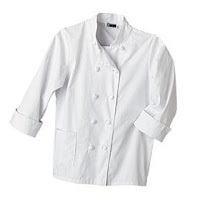 He also was a member of the faculty at Cabrillo College in Aptos teaching advanced culinary arts. Sometimes a berry can be berry confusing. The strawberry, one of the most popular fruits grown in the world, is just one of those berries. So let's set the record straight. A strawberry, first bred in Brittany, France in 1740, is not a berry at all. One of the criteria for being so named a “berry” is to carry seeds within its flesh. We can all see strawberries skip this step, carrying their seeds on the outside, and not within at all. And how about this, “what does straw have to do with a berry”? Some sources credit the name "strawberry" to the technique of spreading straw over a plot, providing shade and a structure for the plant to grow, while others note it was first known as the "strewberry" due to the way the berry grows, "strewn" across the ground. Not to be lost among its peers, the strawberry can be grown anywhere. From climates in Florida to Texas, Wisconsin to California, strawberries just require good sunlight and water, making it one of the easiest plants to grow whether in a backyard garden, a cultivated field or as simple as a potted plant. Strawberries are one of the most versatile fruits. Fresh or preserved, frozen or dried, any meal, any course can be made more delicious with its sweet and fragrant addition. A light, but sweet salad can set up any meal for success. Or end on a sweet note with a scrumptious, strawberry dessert like Strawberries and Cream, famously devoured at The Championships of Wimbledon. In a large bowl combine the spinach, strawberries, and almonds. Combine the vinegar, apple cider vinegar, honey and sugar in a small bowl; stir well. Drizzle over salad and toss to coat. Serve immediately. Combine the strawberries and sugar in a bowl; mash until the strawberries are completely crushed and the sugar is incorporated. Add the sour cream to the strawberries and stir until the mixture is pink in color. Serve immediately. 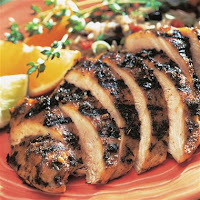 Just in time for grilling season, prices are rising for beef, pork and poultry. Wholesale prices for pork, for example, reached a 14-year high last week in futures markets, while beef is up 22 percent this year. Chicken's gain in March was the most in 20 months, according to the U.S. Department of Agriculture. Many grocers and restaurant owners have passed on some of those costs to consumers, who had benefited from lower prices for a long stretch until this year. Retail prices may even set records in the next 90 days as demand peaks during the summer grilling season, said John Nalivka, a meat industry consultant in Vale, Ore.
One major Kansas City area grocer, Hy-Vee, said a pound of 85 percent lean ground beef now costs about $1.99 a pound, up 30 cents from two months ago. During that same time, T-bone steak has gone from $5.99 a pound to $7.99. Ruth Comer, a spokeswoman for the West Des Moines, Iowa-based chain, said prices could be up to 25 percent higher than prices a couple of months ago. Q. How many pounds of crab will I need? A. Figure at least 2 pounds per person of gross weight. This equals one pound per person after it has been cleaned and cracked. Order more if you expect people to eat more than their share, or if they are serving themselves. Q. What should I do with leftover crab? A. You can always bag them up and sell them at the end of the feed, or raffle them off as raffle prizes, so that you are not stuck with the remaining crab. Q. What is green crab? A. Green crab is crab that is weighed before it has been cooked. Make sure that you are comparing apples with apples when pricing. Some purveyors quote on green crab, which will be a lesser amount for your dollar, because you are paying for the weight before it is cooked. You lose approximately 15%, so you will be paying for product that you don't really receive. If it sounds too good to be true, it probably is. Q. What do I need for a crab feed? Q. How much cocktail sauce do I need? A. Approximately one gallon (128 oz.) per 64 people. This is based on an average of two ounces per person. Q. How far in advance of the event do I need to place my order? A. One week (a few rare exceptions are available - ask your sales consultant). Q. Can I get a Saturday delivery? A. Yes, for orders over 1,000 pounds. Otherwise, we will deliver on regularly scheduled delivery days. You may also 'will call' (pick up) your product during regular business hours. Q. What is an average price for a crab feed ticket? Q. When ordering crab, how come I pay for 2 pounds then receive only 1 pound? A. You pay for the whole crab, which weighs 2 pounds (approximately). Then after we clean and crack it, and discard the waste, you are left with one pound of finished crab, ready to eat. Q. What is the best way to sell tickets? A. Advertise! Word-of-mouth, flyers, use the people in your organization to sell tickets. Q. How do I advertise? Q. Do I pay for my crabs when I receive them? A. Yes (there are some exceptions - ask your sales consultant). Q. Is there a preferred day or time to have a crab feed? Q. What type of raffle prizes draws most interest? A. Anything from cars to vacations, golf equipment, lobsters, etc. Q. How many people does it take to run a crab feed? Q. How do the crabs come packed? Will the boxes leak? A. The crabs come packed in shipper boxes lined with plastic. The crabs will be covered with ice. The plastic lining keeps the boxes from leaking. Q. If I have extra crab left over, what should I charge for them? A. You should charge at least what you paid for them, if not a little more. Q. Which is better: serving the people buffet style, or allowing the people to serve themselves? A. If you are serving the people, you maintain control over portions. If they serve themselves, it can (and will) turn into an all-you-can-eat event. Q. What other types of foods should I serve? A. Some suggestions might be salads, pasta, prawns. clams, clam chowder, fruit plates, veggie plates, etc. Q. When is the latest I can add to my crab order if I know more people are attending than originally anticipated? A. That Monday morning (if feed is on Friday) - generally 5 days before. Contact your sales consultant for emergencies. Q. Which would generate more revenue, a crab feed or a Cioppino feed? A. Both are equally good for creating revenue. Q. What about cooking preparations? A. Normally, the Dungeness crab is chilled and ready to serve, right out of the box. It's very easy - preparation is kept to a minimum. Q. What does the cleaned and cracked crab look like? A. Usually they come 1/2 bodies with legs attached, cracked and ready to go.